Bryce Harper got the Nationals off and running last night when in the third inning, he catches some type of 89 MPH slider from Shelby Miller down in the zone. It lands in the seats in left center field to give the Nationals a 3-0 lead, his 33rd home run of the season. 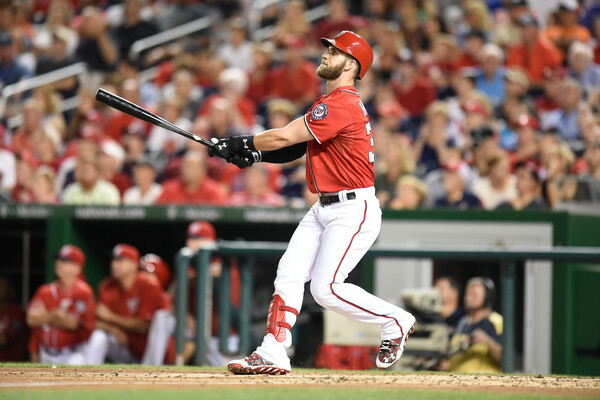 Harper is now hitting .337 on the season with 100 runs scored even. He’s hurting the Braves in this series no matter how they try to deal with him. He became the first player in about a century on Thursday night to have four walks, four runs scored, and a run batted in when the Nationals won 15-1.